I tell you, Theodore Roosevelt knew what he was talking about when he said that. As a new mom, I'm lacking the confidence that I typically have in every other situation I'm involved in. Nearly all of our friends already have children, and some are on their second, so I'm the late entrant into the Mommy Game. While we were still in the hospital and in contact with Isaiah's birth mom, I felt so upset because he knew her and not me. Being completely illogical, because he had just met me, but had been with her for nine months, I felt like I was doing something wrong by adopting him because he clearly loves her. Once I settled down a little, I realized that just as we have to get to know him, he has to get to know us. I'm amazed and delighted to see how quickly this has happened. We have had lots of visitors since we came home from the hospital, and one of our friends with a new baby came over to visit. When she went to change her son's diaper I noticed that she had a onesie underneath the outfit he had on, and immediately I started to think I was a bad parent. I only dress Isaiah in his outfit, and almost always have a receiving blanket with him. If we're going outside he has his fluffy green blanket that goes in the car seat with him. So when they left I started telling Josh how I feel so bad because I under-dress our son and I must be a bad mom. 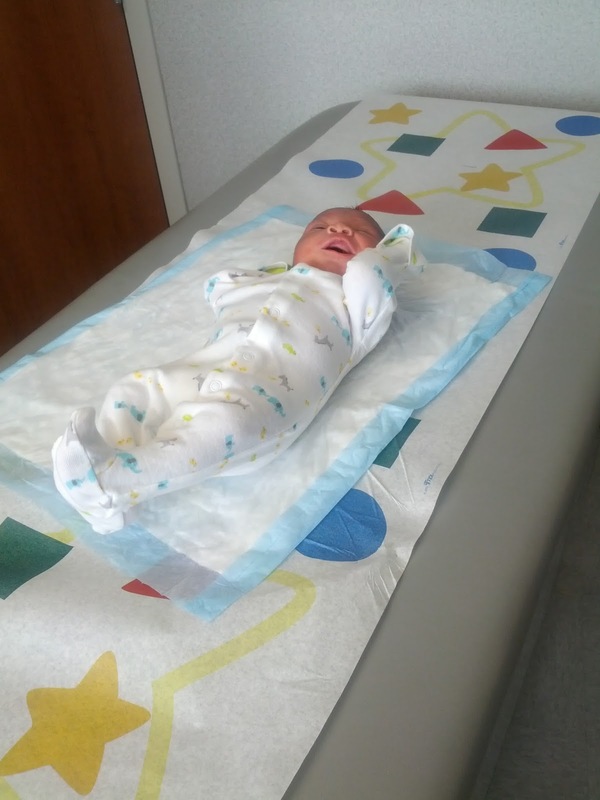 He looked at me and gave me his exasperated look that I've come to know so well, and reminded me that just that morning we had been at the pediatrician's office and Isaiah's temperature was nearly perfect. It is hard, but I have to remind myself to take a step back and realize that I'm not other moms, and Isaiah is not other children. He is my son and I am his mom. Ultimately I know that I'm doing what is right for him, I just need to remind myself from time to time. Or Josh will. An additional note, I've had a lot of people curious about how our relationship with each other is. I can honestly tell you, as Josh told me this afternoon, our marriage already feels stronger because of Isaiah. This is not to say that all marriages should, or will. If you try to compare yourself to us, you'll most like start to feel like I did about the onesie situation. Every relationship is different, as is every child and situation. I told my infertility friends this too, but it can be said for everyone: it doesn't matter what someone else is going through. Your situation is unique to you, and no matter what anyone says or thinks, you know what is best for you. Now I'm off to read about how to practice what I preach. I think this is EXACTLY what I needed to read today! Usually I have a great attitude and perspective, but today... not so much! I just kept being jealous and snotty about how EASY things seemed to be for everyone else and how hard they've seemed for me lately. However, so true, by focusing on others, and focusing on what I DON'T have, I'm missing today's blessings. Thanks for being open and honest and sharing! Good! Life isn't so bad when we just look at all we have, right!? This was great for me today as well as all my friends seem to be having babies and I am ages away but made myself feel guilty about it which is so lame but comparing ourselves to others is so easy to do!